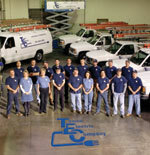 Towne Electric is a growing company offering all facets of commercial and industrial electrical services. Serving the Bay Area for over 20 years, we have amassed a longstanding and loyal customer base. Our services are backed by unsurpassed expertise with dedication to quality, workmanship, and satisfaction, all at a cost that is reasonable and realistic. Our company consists of (3) divisions: Electrical Construction, Automated Machinery Controls and Panel Design/Build. Our capabilities include design and construction of new and altered systems using modern state of the art methods. We also offer maintenance service on systems both old and new. semi-conductor, food processing and water treatment. We have the knowledge and skills to assist you with a wide variety of electrical situations and dedicated professional who care about doing a quality job. So, when the need arises, large or small, give us the opportunity to show you why we should become “Your Electrician”.